In the spirit of March Madness, I wanted to create a basketball related visualization. Initially, I was going to create a simple scatter plot of points/game vs rebounds/game since those are two of the most important stats in basketball and good indicators of offensive and defensive performance. I also thought it would be interesting to see how position and salary correspond to those stats, so I added the former in as the color and the later as the radius of each point. Hover over a point for more player information. Colors indicate starting position. Radius indicates salary for 2013-2014. 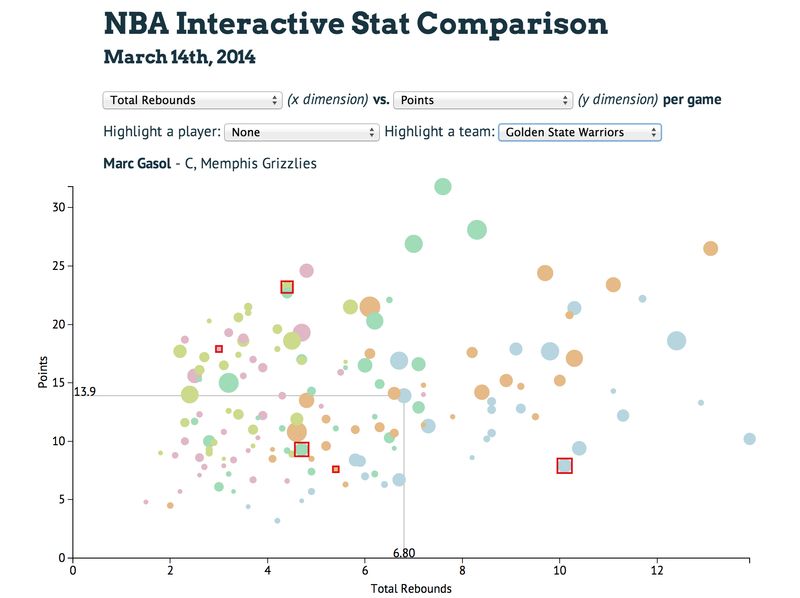 Data provided by basketball-reference.com and taken March 14th, 2014.